Get in-depth hockey coverage from McKeen's Hockey Online! We have profiled and scouted hockey players from junior (McKeen's NHL Draft Guide) through to the NHL (McKeen's Hockey Yearbook) since 1994. Our website is an exhaustive resource of hockey insight. Detailed player profiles updated every season through our acclaimed magazines. There is no deeper resource on hockey available. 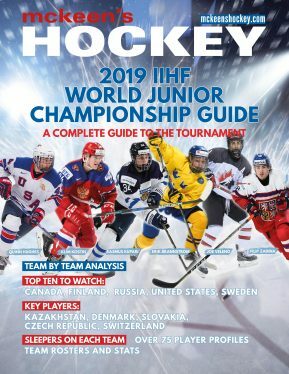 Your subscription includes three digital magazines in a PDF format (2019 IIHF World Juniors Guide, McKeen's NHL Draft Guide and McKeen's Hockey Yearbook) plus exclusive online content and updates. 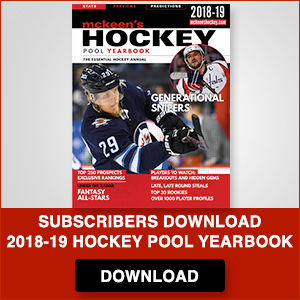 *Please note these are a recurring subscription - that can be cancelled at any time either in your account on the website, or by e-mailing info@mckeenshockey.com - you will receive the full three months access to the site regardless when you cancel. Season long prospect coverage including feature articles and over 125 draft eligible scouting profiles by the end of the season. Our team of scouts are located around the world and are our eyes in the rinks providing detailed scouting reports throughout the season. We have a deep and extensive database of thousands of prospect scouting reports and profiles. 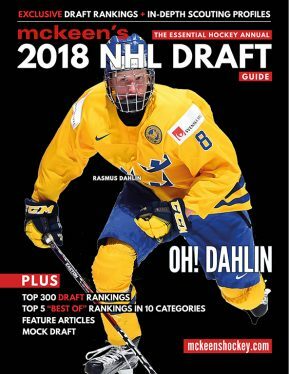 Exclusive 2019 NHL Draft Rankings. 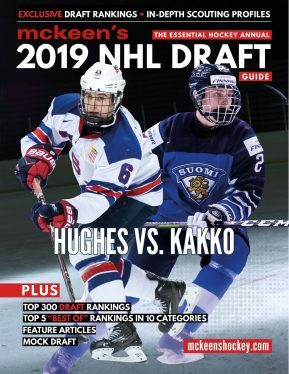 Featuring all of the scouting profiles and articles from McKeen’s 2018 NHL Draft Guide and prospect profiles from McKeen's Hockey Yearbook. Mobile web enabled for smart phones. Easy access to in-depth player profiles at your fingertips. Top 475 projections and many statistical charts downloadable to Excel. Thousands of player profiles. Detailed player profile and scouting reports going back five seasons. Extensive database of prospects including top 250 rankings for 2018-19. 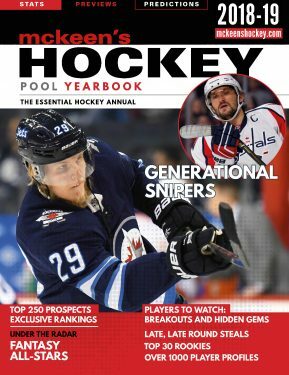 Thousands of players profiled in a deep hockey resource. Be completely up to date for your NHL 18 -19 hockey pool. Predictions and projected line combinations updated until the start of the season! 244 pages, over a 1000 player profiles, team predictions. Perfect for Tablets and e-Readers. Downloadable to a PDF. Top 300 exclusive rankings, player scouting reports and profiles. Player profiles of the top 124 prospects. Top 5 “best of” rankings in 10 different categories. Feature articles and more (over 100 pages).